This small group of volcanic islands off the African coast is one of the more interesting places on Earth with almost ideal temperatures. The name comes from the Latin, meaning islands of the dogs, not the birds. The Spanish gained control of them 600 years ago, and tourists have been flocking here ever since. A notable visitor was Christopher Columbus, who stopped by on each of his four voyages to the “new world” to do last-minute ship repairs and stock up on provisions for the long trips ahead. One could only suspect that after weeks at sea he might have regretted leaving the Canaries. The “Age of Exploration” had begun, and the pope, to be accommodating, divided up the newly discovered lands between the Spanish and the Portuguese. The Spanish found vast amounts of gold and silver in their new possessions, which, during the 1500s, allowed them to buy almost anything they wanted in Europe. Yet, 200 years after Columbus, Britain had become far richer than Spain. What did the Spanish do wrong and the British do right? Until the last few centuries, most of mankind has lived at subsistence or slightly above it. During the height of the Roman Empire, perhaps a couple of million people had some surplus to spend on luxuries or leisure time, but that all came crashing down 1,500 years ago. The capital stock — roads, irrigation and water works, ports, terraced fields, homes and other structures, did not all disappear, and are still used by modern Italians and others to this day. This capital stock and nature’s bounty enabled the Italians to live a bit better than most others up to recent times. From 1700 to the current time, British real per-capita income has increased by roughly 3,500 percent. 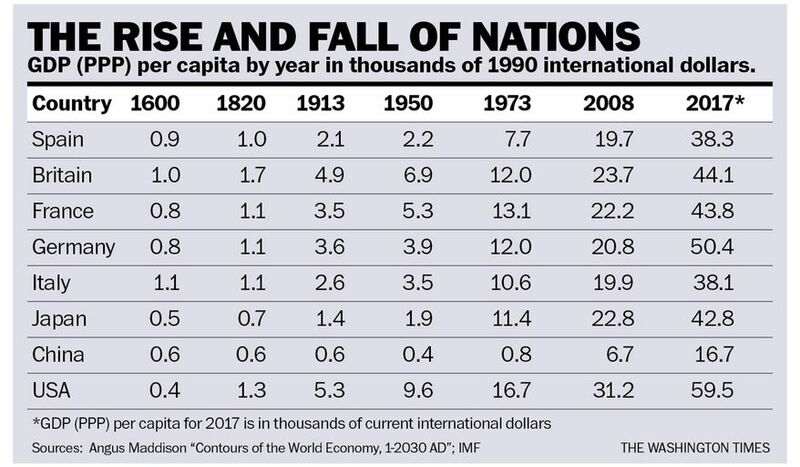 The other countries in the table have also had similar spurts of growth in real per capita income — some a bit more and some a bit less. The U.K. and the Netherlands are where the industrial revolution began, along with the acceleration in economic growth. They were the first nations to embrace the modern concept of the rule of law, protection of private property, as well as the development of new types of financial institutions that allowed for the formation of large pools of capital with fostered investment. Perhaps, the best contemporary economic historian is Deirdre McCloskey, who has written extensively and provocatively about economic development issues. She argues that the rate of innovation is key, and that depends on the way people think about the merchant and manufacturing class. In America, and increasingly throughout the world, entrepreneurs and innovators are celebrated. They appear on magazine covers and on TV talk shows, mostly in positive terms. Apple’s Steve Jobs was idolized. TV shows like “Shark Tank” are built around identifying those with the next great idea. At the same time that self-made billionaires are being praised, there is a rise, particularly among young people, for more equal income distribution – and many seem unable to understand the contradictions. People who are trying to do the next Silicon Valley super start-ups are wearing “Support Bernie Sanders” T-shirts. The world still has too many lagging nations. India, only recently, changed policies enough to achieve a few years of high growth; yet, the jury is still out as to whether or not the country can keep making the changes necessary to give its population a middle-class income level by the next generation. China began its reforms 40 years ago with spectacular results — but now it is at the point that it will need to make substantial reforms in its financial system and protection of private property. These reforms, by necessity, will reduce the power of the state. At various times in history, China has been the world’s richest country; yet, it has always managed to throw its prosperity away. Will it be different this time? Chile has shown the way to break the curse of economic stagnation, or worse, in Latin America. Venezuela, by contrast, shows how quickly a rich country can be destroyed and become poor again. Will most Latin Americans make the choice to emulate Chile and become rich, or give into the siren call of socialism and become the new Venezuelans?